HeroCry Saga : Join the saga of HEROCRY: an amazing Hero fantasy. Collect and train your heroes, gather your teamates, strengthen your heroes and stop the Dark Lord to save the world. From cute to stylish, collect Heroes of all sizes and shapes! 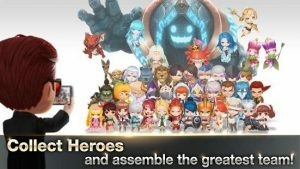 Collect over 300 types of Heroes as many as you can and assemble the greatest team! Witness the awesome display of each Hero’s unique skills! Level up stronger and faster to customize and strengthen your Heroes! Your Heroes will evolve to change in looks and gain additional skills! Various Rune sets to pick and choose additional abilities for your Heroes! Customize your team’s formation and manage their skills to strategize for the battle! Fight Epic Boss with your 300 Heroes! Experience the largest-scale Raid that you have never seen before! Duel with other players to prove your worth! Use various tactics to crush your opponents! Win the battle by strategically placing the strongest Heroes! Build or join a guild of friends! Fight alongside your guildmates to earn the honor of being the best guild! Fight and explore through Adventure! Dive deep into the story through many different regions! Go on an adeventure as you train your heroes! Your app may not offer individual access permissions, and you can revoke access in the same way. 450MB or more is required in device storage. Follow up on the latest news and events on the HeroCry Saga official community!